Like a lot of the people we feature on GeekTech, Brian Egenriether is an inventor—a modern-day, homebrew-loving Leonardo de Vinci. He's also the guy who made this Skittles Sorting Machine. Personally, I've never felt any sort of discrimination towards confectionery but it's still fascinating to watch the machine do its magic. Within a relatively short (or ridiculously fast, depending on how you interpret such things) span of time, Brian's machine is capable of separating, identifying, and maneuvering Skittles of various hues into one of five bowls. Sure, this is probably not going to win Brian the Nobel Prize anytime soon, but it's still an…interesting show of ingenuity. 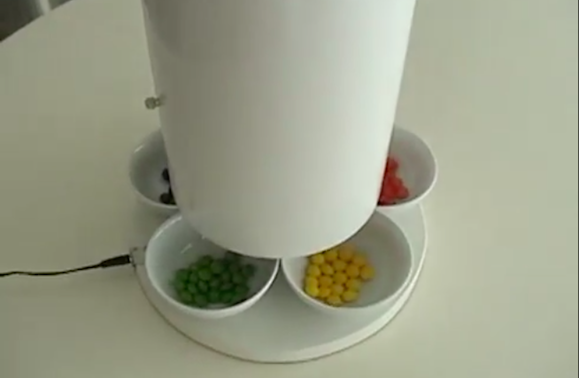 According to the video's description on YouTube, Brian's Skittles sorter makes use of BASIC Stamp 2 and 3 servos for actuation, an IR LED and photo-transistor to stop the turnstile in position, re-purposed parts from a hummingbird feeder, and a telescope, to name a few of the components used. If you're wondering why the process takes as long as it does, Brian explained that it has everything to do with his "color discrimination circuit." It seems that the camera needs to take a certain amount of pictures before the the machine is capable of determining the actual color. Brian claims that the machine could probably go through a whole bag in 20 seconds, but that would also result in a lot of mistakes. Now, here's the important question: Do the red ones really taste better than the green ones? This story, "The Skittles Sorting Machine is a perfectionist's dream come true" was originally published by TechHive.